Europe is preparing for a robot revolution. European lawmakers have proposed that robots be equipped with emergency "kill switches" to prevent them from causing excessive damage. 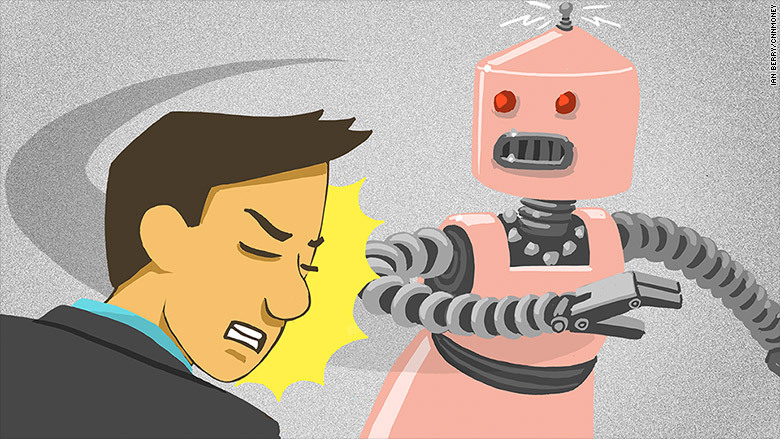 Legislators have also suggested that robots be insured and even be made to pay taxes. I think that if robots have to pay taxes then they should also be able to vote! I came across two cool projects on github recently. The first is the sourcecode for the Apollo 11 command module and the lunar module. Apollo 11 made its historic trip to the moon in 1969. Neil Armstrong and Buz Aldrin landed the lunar module; Milchael Collins piloted the command module. The code is a flavor of assembly language and while it is pretty cryptic it is sprinkled with lots of comments, and if you read it carefully you can find some jokes and comments about the times. While modern releases of PhotoShop are written in C++, this early version is written is Pascal. Really coold stuff though, and really well written code for so long ago. We started as a Mom and Pop business, and now some people are saying we have become too large. We say there is a big benefit to being large. Instead of having a single radiologist we have many, each an expert in a different area. What they were saying I guess is that a radiologist that worked mostly looking at X-Rays of broken bones, may not be that good at detecting areas of concern on lung X-Rays. MIT is working teaching robots how to pick things up. It can take a while for a robot to learn how to pick up a cup, then a while again to learn how to pick up a plate. Once it learns though it never forgets, What’s more once a single robot learns, all robots of the same model know how to do it as well! There are at least two companies producing robotic systems that can lay bricks and they are both pretty cool. Fastbrickrobotics is an austrailian based company and their robot mason is helping to fill the gap between the housing boom and the shortage of masons. The Wall Street Journal reports that a mason in Sydney can now command a six figure salary. Construction Robotics SAM, which is short for Semi Automatic Mason is a much smaller unit and meant to work along side a mason. Have a look at the web sites for some cool videos of these robots in action. We may move our old blog posts here or not, what do you think?